Eight years after it was promised, the Queen's Medical Center and the state Department of Transportation will begin construction on improvements to the Kinau Street H-1 freeway offramp that should make it easier to get to Queen's from the freeway. But another project to make it easier to get to the freeway from nearby Lusitana Street remains on hold. Gov. Linda Lingle approved the release of $1.7 million from Queen's so the Transportation Department can begin design and construction for the changes to the Kinau Street offramp. No state funds will be used for the project, but the Transportation Department will oversee it and award the contract. The improvements will allow motorists to make a right turn from the Kinau offramp to Lusitana Street to get to the hospital and physicians' office buildings. Contractors will also upgrade retaining walls and relocate utilities near the offramp. "A direct route to the hospital will not only help to alleviate traffic congestion on the H-1 freeway, but will also ensure more immediate medical attention for those in need," said Transportation Director Barry Fukunaga in a news release. Currently, motorists have to exit on Punchbowl Street and drive back around on King Street to South Street to Lusitana, or exit on Kinau and turn on Ward to Beretania, then make a right on Punchbowl to get to Queen's. The project stems from the City Council's approval in 1999 that allowed Queen's to build a five-story parking garage and emergency room entrance. As a condition for the approval, Queen's promised to pay for improvements that would ease traffic congestion on Punchbowl Street. 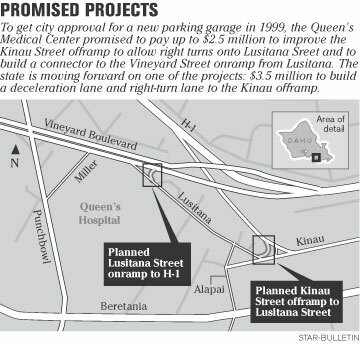 Queen's set aside up to $2.5 million to build a connector to the Vineyard Boulevard freeway onramp from Lusitana Street and access from the Kinau Street offramp to provide another way for motorists to get to the medical center. In 2003 a Queen's executive said if construction costs were more than $2.5 million, other funds would have to be secured. The cost of the Kinau offramp improvements alone is estimated at a little more than $3.5 million. The federal government is providing about $1.7 million. Hawaiian Electric Co. and Hawaiian Telcom are also putting in about $79,000 to cover the expense of relocating the utilities. "We're going to have to seek other funding to do the second part of the project," said transportation spokesman Scott Ishikawa. A Queen's spokeswoman could not be reached for comment last night. Construction on the Kinau project is expected to begin in September, with completion in June 2008. The Kinau offramp will remain open during construction.